Just like last year, a conference app for smartphones and tablets will be available. This blog post is a brief introduction and will hopefully answer most of your basic questions on how to get the app up and running on your device. I want this app – where do I get it? 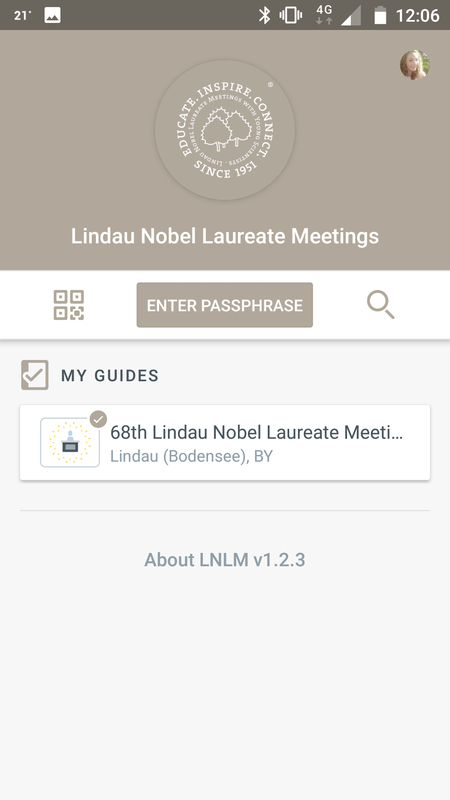 Go to your app store and search for “Lindau Nobel Laureate Meetings” and download it either over your Apple store or over your Android Google Play store. Please note: The meeting app is currently only available for devices running on iOs or Android. If your device operates on another system, you will still be able to access this web-based version via your browser. Understood. But how does it work? 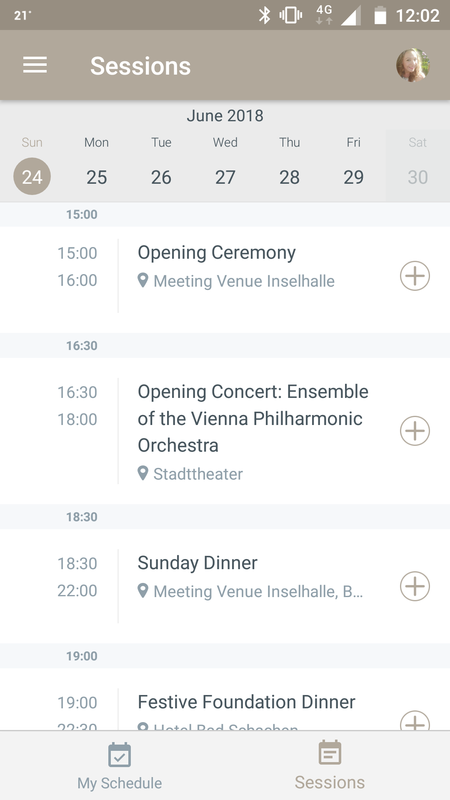 The app is governed by a simple principle: each year, a new “guide” for the respective Lindau Meeting will be released for download. These guides are essentially data packages, just like in some of the travelling apps you might use. 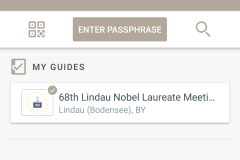 To download the guide for the 68th Lindau Nobel Laureate Meeting you need to open the app and enter the passphrase “genemodification” in the appropriate field. After you’ve downloaded the guide you’re basically ready to go. 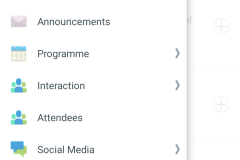 If you’re only interested in having the meeting programme on your phone you don’t even need an account. However, if you’d like to interact and post status updates you’ll have to create one. To log in, you can either use one of your existing social media accounts (e.g. 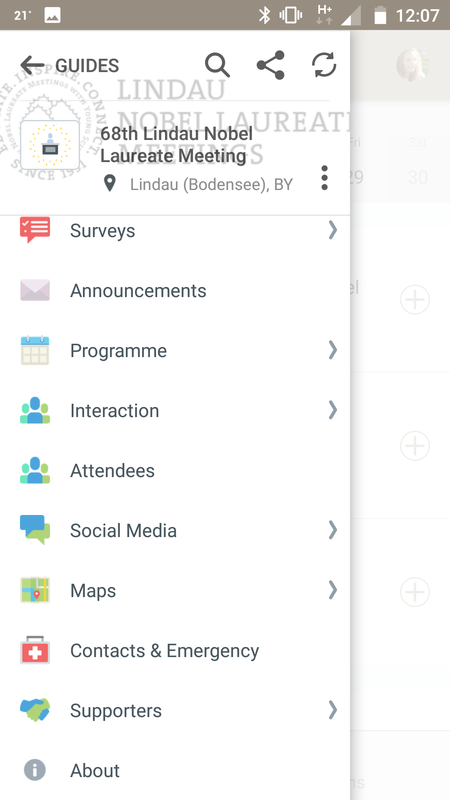 Facebook, LinkedIn and so on) or you can create your own account specifically for the Lindau Meeting app. Yay, I’m in! What can I do now? Participant Survey: We’re always striving to improve the meeting experience. Help us by taking part in this survey and tell us your candid opinions! Announcements: Here you’ll receive official messages from the meeting organisers, useful tips and information as well as last-minute-changes in the programme should they occur. Programme: This section contains all the information on the meeting programme. We’ll get to the in-detail explanation in a few minutes (scroll down, if you can’t wait!). Interaction: You’ll find three items in this menu. 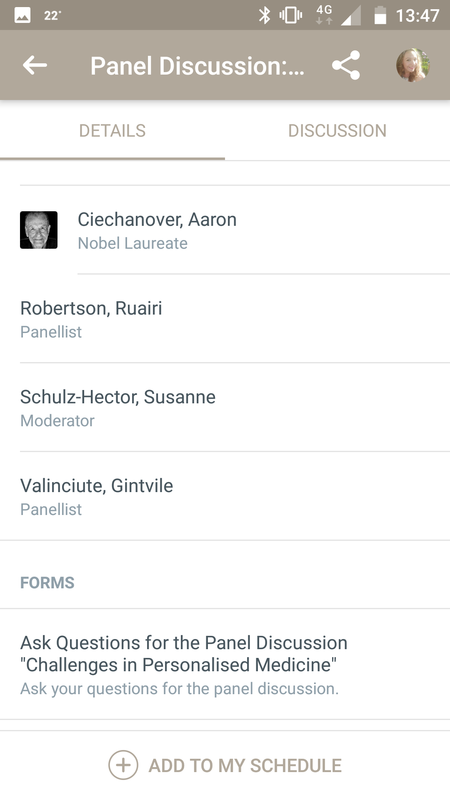 “Participants” let’s you see a list of all the meeting attendees that are using the app. From this list you’ll be able to add people to your contact list, e.g., “make friends”. “Chat” is where you do your private messaging – be nice or get banned, simple as that. “Timeline” is where you can post your status updates just like on any social network. 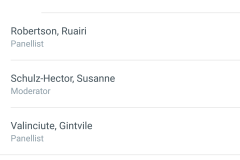 Attendees: A separate list that let’s you also see who is using the app. Social Media: You can access all our social media channels including our blog and the mediatheque from within the app. Maps: You can find multiple helpful maps in this section. A google map shows you basic facilities like taxi stands or ATMs throughout the city of Lindau. The second map is a collection of overview maps, including overview maps of the meeting venue Inselhalle and other event locations. 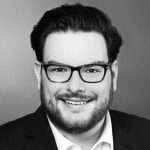 Contacts & Emergency: This includes the most important phone numbers during your stay in Lindau as well as German emergency numbers (Ambulance: 112, Police: 110). Supporters: A comprehensive list of the fine people, companies and organisations supporting the Lindau Meetings. About: In case you were wondering where you currently at and what this app is. Hey! You promised to explain the menu item “Programme”! Don’t worry, I didn’t forget. First, please take a look at the following two screenshots, then read the description below. 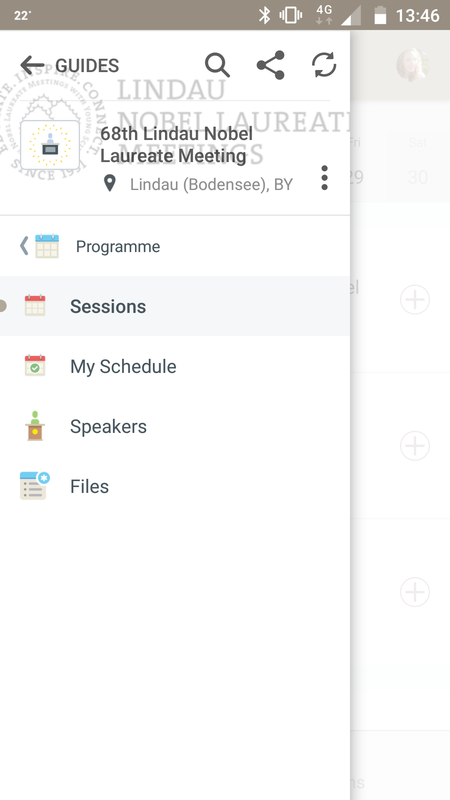 “Sessions” basically is the in-app version of the meeting programme including all times, locations and speakers. 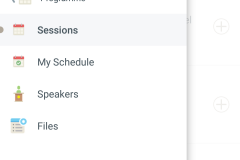 By tapping the little plus sign (right screenshot) you can add any session to “My Schedule” and even instruct the app to remind you of them before they start. Please note though: This is NOT a replacement for pre-registration for the sessions that required it. If you’re unsure, take a look at the conference materials you have received upon registration – these include your official personal agenda. “Speakers” shows you a list of people who will… well, speak at the various sessions. Under “Files” you’ll find PDFs of the programme booklet, participant directory and more. Wow…this panel discussion sounds interesting? Will there be questions from the audience? 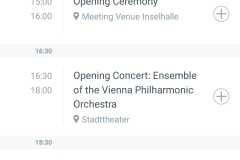 If you tap any session from the schedule its details will appear. 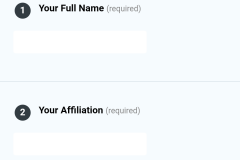 These include the speakers and, in case of the panel discussions, also some attached “Forms”. 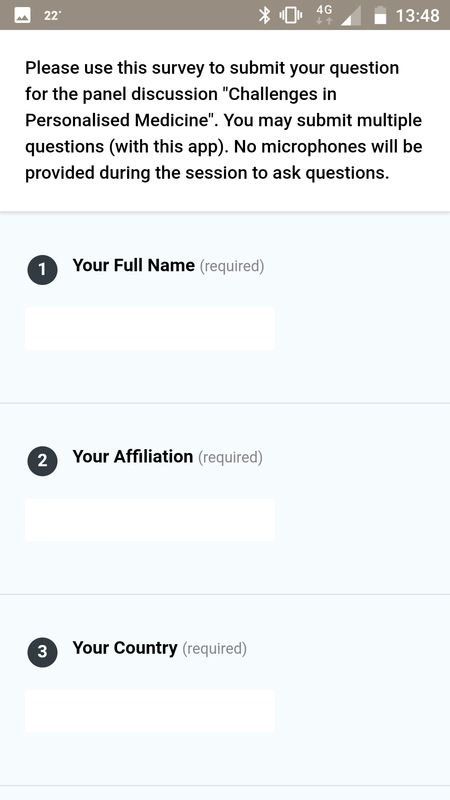 Tap those and you’ll be sent to the screen where you can submit your question, name and affiliation (right screenshot). In theory, you can submit as many questions as you want, but there is no guarantee (nor possibility) that the moderator will be able to include all of them in the panel discussion. Hopefully, this little guide was able to solve your most urgent questions about our meeting app. If you need more help, try to ask anybody around you at the meeting but please be aware that most of our employees and contractors are not tech people.